Trend intelligence company Bottlenose has partnered with media monitoring firm Critical Mention to combine analytics for real-time trends in TV, radio, social platforms such as Twitter and Facebook, online news, and blogs into the same tool. LOS ANGELES: Trend intelligence company Bottlenose has partnered with media monitoring firm Critical Mention to combine analytics for real-time trends in TV, radio, social platforms such as Twitter and Facebook, online news, and blogs into the same tool. Previously, the TV and radio layers had been absent from all social media listening applications, said Dave Armon, president of Critical Mention. He added that Bottlenose is addressing a gap in the market by integrating the Critical Mention API (application programming interface) with Bottlenose’s Nerve Center product to display relevant broadcast coverage and other related topics. "Nerve Center is a social media visualization platform that helps companies see what words are mentioned alongside products, executives, and brands in social, but until today, they never had mainstream media [included] in terms of TV or broadcast coverage," said Armon. "Previously, Bottlenose users might have seen people tweeting about an episode of Scandal, but they didn’t have access to the video everyone was talking about. Now they can see the segment everyone went crazy about on Twitter." The integration of Critical Mention’s API will let Bottlenose users identify TV and radio segments across 2,000 broadcast outlets in the US, UK, Canada, and the Middle East that are driving spikes in social conversation, according to Nova Spivack, CEO and co-founder of Bottlenose. Bottlenose is also leveraging Critical Mention’s ability to ingest 40 hours of video per minute. Bottlenose’s Nerve Center platform has been used during major crises for beverage and travel brands, detecting issues early, he added. 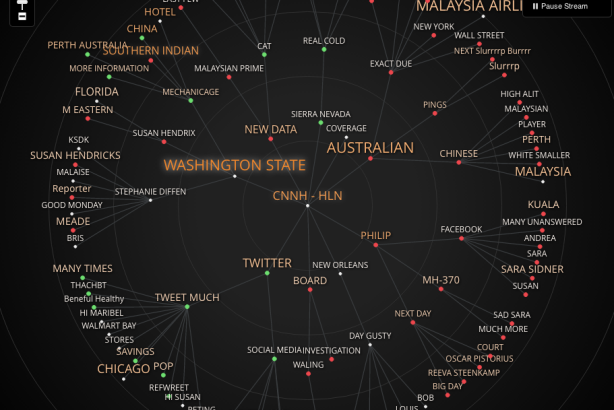 Nerve Center’s data has also shown brands whether they should engage with a crisis situation. "Sometimes brands take a kneejerk reaction and they engage right away; that adds fuel to the fire," said Spivack. "Sometimes we can see a problem is going to go away on its own and engaging too much may actually perpetuate it." Brands that have used Nerve Center include PepsiCo, Warner Brothers, and General Motors, and the platform has also been employed at events such as the Super Bowl, the Academy Awards, the Grammys, and the Boston Marathon. Spivack would not specify what brands used the tool during crisis situations. Agencies such as FleishmanHillard, Razorfish, and Digitas have also used the tool. The service, which has been on the market since Tuesday, is custom priced, based on clients’ needs.